4:10am est I wrote from BWI airport, “My musical journey continues. Today I start the U2ieTour – 15 shows in Vancouver, Denver, Chicago and NYC.” I woke up at 3am after about two hours of sleep – a little dozing off and on before that. I drove to Fast Park and was at security just after 3:30am, but security wasn’t open until 4am. I was supposed to be at the airport two hours ahead because I had an international flight even though I had a layover in Dallas. There was no need for me to be at the airport that far in advance because security wasn’t any different than any other flight. I was at my gate by 4:10am for a 5:30 flight. While waiting for my flight I started my four days off of Nutrisystem (after three straight months of nothing but) with a chicken and cheddar flatbread sandwich with mayo. I only ate half and saved the other half for my layover in Dallas. It’s a good thing too because American Airlines doesn’t give you even a bag of peanuts on your three and a half hour flight, just sodas. I met Sabina, a friend of Dahna’s and works for atU2. She was on both my flights to Vancouver. Half of our flight from Baltimore to Dallas was military, who boarded before us – even though I had paid for an upgraded seat and to board first. So at first there wasn’t room in the overhead compartment for my bag, but the flight attendant helped me as I held up the line to board the plane. Then we had to wait about a half hour once on the plane for the luggage to get on. For the entire flight, I listened to U2 while napping. For my second flight from Dallas to Vancouver, I watched three episodes of My So-Called Life. I walked off the plane and was greeted with “Bonjour.” For a moment there, I thought we were in Montreal instead of Vancouver. Customs was easy and quick. I grabbed a cab and met Jenny at the Sandman Hotel just after 11:30am cst. We checked in, unpacked and walked over to Rogers Arena to check out the GA line. Jenny already had her number (28), but I wasn’t getting in line. Just wanted to see the arena and everyone. On our way, we rain into Joel, who I had met at our Boston MeetUp back in November. After talking to some of the folks and adding our cities to the GA Banner, we saw the Merch tent was open. In fact, it literally just opened at 1pm the second we walked up to it. So Jenny was the first person in the world to buy a U2ieTour shirt – I was the second. We walked through the cobblestone streets of GasTown and saw the historic steam clock. We ate at Miku and had the best sushi we’ve ever had. It was this cool little spot across from Canada Place. We sat out on the patio in comfy chairs overlooking the water and the hustle of the city. After our amazing lunch, we walked around Canada Place taking in the beautiful views of the water and the mountains. We went to the pharmacy and got snacks and drinks for our stay. I was good and got cheese, baked wheat thins, protein bars and water. Last tour I used to snack on donuts, chips and sweet tea. On our way back, we ran into Tim (from Chicago who I hung out with a lot on 360). I went to our Fan MeetUp at Moxies – the bar/restaurant in our hotel. There was already a bunch of people there who came early. I met Joe (of GA Joe fame) and Nick, who is a huge Golden State Warriors fans – so we made the bar turn on the Grizzlies-Warriors game but they shouldn’t have bothered. Ugh! Matt and Melissa went out of their way to come visit me even though they had other plans. I autographed (with a sharpie) a copy of my book for them. I met Chris, who wanted to buy a copy of my book – the only other copy I had with me. It was my first Canadian money – and I earned it! I was really bad for dinner. I had a huge bacon cheeseburger and sweet potato fries, but I didn’t eat all of the roll. I also met Chadd, Katrina, Naomi, John, Anthony, Nurtaila, Kami, Heather and Kevin. It was great to meet everyone and put faces to the names and to see old friends from tours past. I was exhausted from being up for over 24 hours traveling and walking around the city of Vancouver, but still didn’t go to sleep until 1am cst (which was really 4am my time). Vancouver Day 2 – May 14, 2015 6am Only slept for about 4 hours waking up at 5am but stayed in bed until 9am. I met Kevin O’Quinn at Moxies at 10:30 to do a podcast for his website. It was a blast! Can’t wait to share it with everyone once he sends me the link. After, I walked to GasTown and met Chadd at The Flying Pig for lunch. It was phenominal, but I didn’t eat much and took most of it back to the hotel for after the concert. I got three sides: the friend brussel sprouts, the four cheese ganouche and the bbq poutine. We walked to Rogers Arena so I could sell Darryl my Larry Mullen Band shirt that he wanted – a very happy customer! I said Hi to my friends Michelle and Anthony and some other familiar faces. Then we walked around to where the band would drive in. There were about 10 people or so waiting, but it was a very busy street and I thought there was no way U2 would stop to talk with us. Just around 2:30 the garage door went up and a black suv drove in. Someone got out of it, but I couldn’t see who as it was across the street and in the shadows of the blinding sunlight. Everyone, including my new friends Chadd and Naomi, said it was Larry. Feeling safe that Larry was tucked away inside and not coming out, I went back to my hotel to rest before the concert. I had no intentions of waiting to meet the band anyway in light of Larry’s dad passing away just a few days before. I was under the impression the whole band went back to Dublin for the funeral, but apparently just Larry flew home. 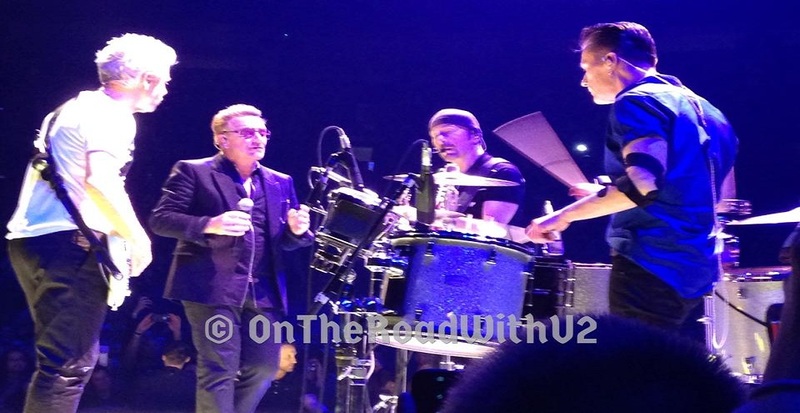 U2ieTour Opening Night Vancouver 5.14.15. This was my 76th U2 show overall, but my first U2 show outside of the U.S.. I got in the GA line at 6pm and my first U2 friend Mike was there in line. Mike and I have been friends since high school when we used to spend countless hours watching U2 interviews, concerts and specials we had taped from MTV. We went to our first U2 concerts together and we went to these first two U2ieTour shows together, which was really nice. Chadd, Mike and I walked right in easily swiping our credit cards and getting our wristbands. Once inside I noticed the e stage where I wanted to be was not that crowded. There was a spot right next to Jenny, so I snagged it and Chadd and Mike stood behind us. We were at the end of the e stage in front of the stairs next to Larry’s drums. But the drums ended up being to the left of us, so we were actually behind Larry rather than next to him. And only Bono used the stairs in front of us when he left – Larry used the other stairs. We had originally thought U2 was going to enter through the tunnel on the e stage because that is where we saw Edge’s wife, Adam’s wife, Gavin Friday and Guy Oseary come out of. But they didn’t. U2 entered on the main stage, way on the other side of the arena, and exited in front of us from the e stage. I liked standing at the e stage, sort of the equivalent to the b stage on ZooTv and PopMart. Bono spent about half his time on the e stage and runway combined. The band as a whole only played four songs on the e stage and two songs on the runway. Everything else was on the main stage. Folks at the main stage said they couldn’t see anything that was going on at the e stage, but we could see everything from the e stage but the main stage was far away. If you stood along the runway, you could see both stages because you were right in the middle. Even though there was no opening act and we were under the impression that meant U2 would take the stage earlier and play longer, U2 did not take the stage until about 8:15pm right after The Ramones’ “Beat on the Brat” was played. The U2ieTour Opener in Vancouver on May 14, 2015 went as follows: “The Miracle” (main stage), “Out of Control” (main stage), “Vertigo” (main stage), “I Will Follow” (main stage), “Mofo” snippet / “Iris” (with Bono on the runway) , “Cedarwood Road” (with Bono in the screen), “Song for Someone” (Bono on e stage), “Sunday Bloody Sunday” (band on runway), “Raised By Wolves” (Bono and Edge on runway), “Until the End of the World” (Bono and Edge on runway), Intermission with Punk Interviews (5 minutes), “Invisible” (band inside screen), “Even Better Than the Real Thing” (band inside screen then e stage), “Mysterious Ways” / “Burning Down the House” and “Young American” snippets (band e stage), “Desire” / “Love Me Do” snippet (band e stage), “Sweetest Thing” (band e stage, Bono playing piano and fan Reilly Hannigan filming with Bono’s phone), “Every Breaking Wave” (Bono and Edge e stage), “Bullet the Blue Sky” / “Hands that Built America” snippet (main stage), “Pride” (main stage), “Troubles” (Bono on e stage with his dance moves), “With or Without You” (Bono on e stage), Encore break with Stephen Hawking intro, “City of Blinding Lights” (main stage), “Beautiful Day” (Bono on runway), Paul Simon’s “Mother and Child Reunion” (main stage), “Where the Streets Have No Name” with “California” snippet (Bono on runway), “I Still Haven’t Found What I’m Looking For” (main stage then band walks runway to e stage and exits). This was the first U2 show I have not heard “One.” I started my U2 tours during ZooTv, so every U2 show I’ve been to they have played “One.” Also it was suprising not to hear “Elevation,” which I’ve heard every show since the Elevation Tour. I couldn’t have been happier U2 played my favorites “Pride” and “I Still Haven’t Found What I’m Looking For.” Bono thanked Larry for his strength in returning to the tour after his father’s funeral and thanked Larry’s dad for giving Larry the idea to put that notice up to start a band. And then went into my favorite “Still Haven’t Found,” and I started to cry. As the band approached the e stage to leave. Adam walked off first – down the other stairs. Then it looked as if Larry was going to walk off stage on the stairs in front of us, but Bono sort of cut him off. During most of the show, Bono’s back was to us but now when Larry was going to come over to us, Bono picks that time to stand in front of us and sing. Bono always blocks my view of Larry. So Larry went down the other stairs. They were still singing “Still Haven’t Found” and I’m still crying. I shouted out to Larry as I leaned over the railing so he could see my ‘Larry Mullen Band’ shirt. Larry saw me, smiled and waved. And not the usual smirk head nod combo I usually get. Rather a full on he was actually happy to see me smile (usually it’s look of fear or annoyance) and a real wave, not just a head nod. While this was going on was when Edge fell off the stage, so I completely missed it even though it wasn’t too far from me. The show ended just after 10:30pm. We walked around to where the band would leave but decided they already had left, so we went back to our hotel, ate and went to sleep to wake up and do it all again the next day. To see all my pictures from #U2ieTour Opening Night, please click here. 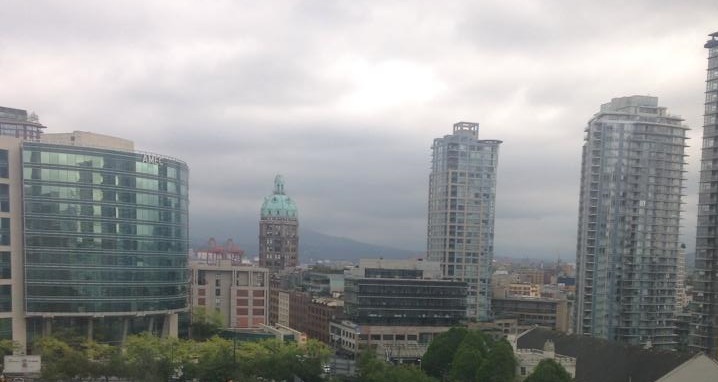 Vancouver Day 3 – May 15, 2015 I woke up around 7am after just four hours of sleep. I relaxed and ate leftovers for breakfast and didn’t leave the room until almost noon. I walked over to the Edgewater Casino, which was on the other side of the stadium which was next to Rogers Arena. When I finally found my way to the other side, I saw police cars and flashing light and bodies lying on the ground. A woman called out to me and said it was ok they hadn’t started shooting yet. All I heard was shooting and then realized, they were shooting a tv show. It’s a Canadian sci-fi show called Continuum. I went into the casino, which was very small. On the first spin on the first slot I played, I won a bonus. A few spins later I won again – this time a big bonus. It was a $1 Wheel of Fortune bonus wheels, and I was playing the max. Within my first five minutes there, I won $300 and I walked out with that $300. I walked around a little on my way back to the hotel and then had lunch outside on the patio at Moxies. I had the most amazing cobb salad with salmon, avocado, bacon, tomatoes and feta. I went up to my room after and rested for a couple of hours. Around 3 or so, I got a couple texts from friends saying they were waiting out for the band to arrive. I also got a text from Jenny saying the GA line was pretty short, so I decided to head over to the arena. Apparently Bono did stop and talked briefly but no autographs or pictures. I got to the arena and ended up talking with Matt, Melissa, Kim, Ayaz, Paul, Anthony and never did see Jenny. 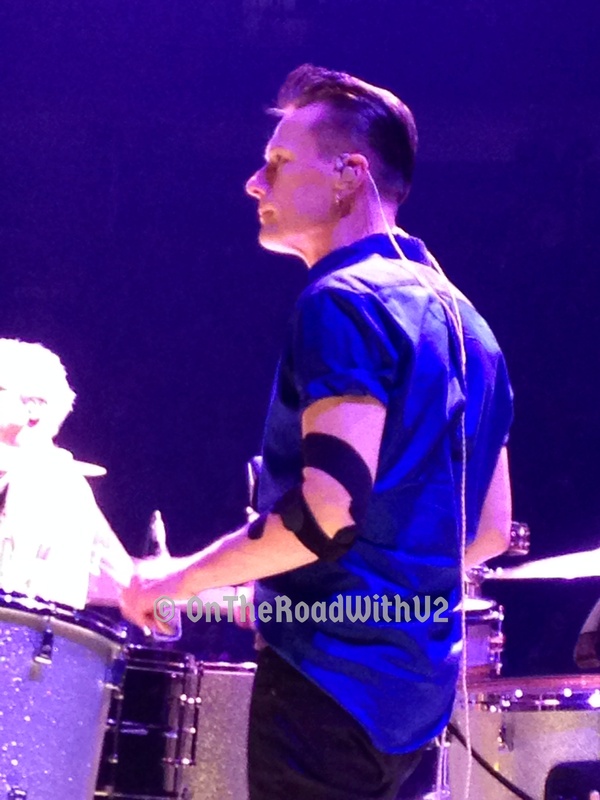 U2ieTour Vancouver2 5.15.15 By the time I actually got into the GA line, it was about 5pm. My friend Jennifer got in line behind me, and I met some local folks. Once inside, I finally found Jenny and she was one person back of the rail where the e stage meets the runway (where Edge fell the night before). I decided I wanted to see the show from a different angle. I went up to the main stage and was about 10 people back, but decided that would get too crowded and I wouldn’t be happy plus I wouldn’t be able to see the screens. I could have stood one person back from the rail along the runway where Larry stops but again it was going to get too crowded there and I wouldn’t be able to see the screens. I decided to stand about halfway back between the main stage and e stage and about halfway between the runway and seats. Mike and his seven year old daughter joined me and I watched the first half of the show with them. I also hung out with Melissa, Matt, Kim, Ayaz, Kim and Kami. It was a great night – and the images on the screen were beautiful! After “I Will Follow,” Bono cleverly said, “Last night Edge fell off himself.” I started to follow Larry around. I somehow made my way right up to the rail on the runway in front of Larry during “Sunday Bloody Sunday” and again in front of Larry during “Invisible.” Then I bolted over to the e stage and made my up to the rail behind/to the left of Larry for that four song set. Right after the show the night before, we got the news that BB King had died so we knew U2 would play “When Loves Comes To Town” and they did. And I was right there to see the gloriousness that was Larry’s drumming! Wow! When the band returned to the main stage, I made my way around the other side of the e stage and stood at the other stairs so I would be there when U2 left the stage. For the second night of the U2ieTour in Vancouver on May 15, 2015, U2 took the stage even later at 8:40pm. The set list was as follows: “The Miracle,” “Vertigo,” “California,” “I Will Follow,” “Iris,” “Cedarwood” (dedicated to Guggi), “Song for Someone,” “Sunday Bloody Sunday,” “Raised by Wolves,” “Until the End of the World,” Punk Rock Intermission, “Invisible,” “Even Better Than the Real Thing,” “Mysterious Ways” (Bono dances with Amp), “Angel of Harlem,” “When Loves Comes to Town” for BB (Melissa is pulled up on stage to film with Bono’s camera). “Every Breaking Wave” (Edge on piano), “Bullet the Blue Sky” / “Hands that Built America” snippet, “Pride,” “Beautiful Day” (“Sargent Pepper’s” snippet), “With or Without You” (on main stage tonight), “Miracle Drug,” “Bad,” (Bono e stage), Paul Simon’s “Mother and Child Reunion,” “Where the Streets Have No Name” and “One.” The entire band walked down the runway together and exited the e stage down the stairs right in front of me. The show ended at 10:50pm. About half of Vancouver was waiting out to see the band leave, but either they left right away or didn’t leave for hours. I went back to my hotel, showered, ate and got a couple hours of sleep before my early morning flight home. To see all my pictures from U2ieTour Vancouver 2, please click here. Everyone seemed to like the second U2ieTour show better than the first. I think I liked the Opening Night better. Actually I liked the pair together with the different set lists. The first night was SO exciting because it was opening night and everything was new and we didn’t know what to expect. I thought the audience was really loud and really into it. And Bono talked more the first night, not politically but about the songs and the tour. The second night was more relaxed and I didn’t think the audience was excited as the first night. U2 seemed more relaxed and having more fun the second night. I also thought the GA section around e stage was much more crowded the second night than opening night. Opening Night set list included “Out of Control,” “Desire,” “Sweetest Thing,” “The Troubles,” “City of Blinding Lights,” and my favorite “I Still Haven’t Found What I’m Looking For.” The second night’s show replaced those songs with “California,” “Angel of Harlem,” “When Loves Comes to Town,” “Bad,” “Miracle Drug,” and “One.” Those differences in the set list are a toss up for me because I love “Still Haven’t Found” more than anything and also love “Out of Control,” but I also love “Bad” and “One.” I was surprised there no songs from No Line on the Horizon played at either show. Is this the first time songs from a previous album have not been played on a tour? I can’t get over how amazing my time in Vancouver was. It’s more than just the fantastic U2 shows. It’s a real sense of community. Putting faces to names of folks I’ve been talking to online for months. And seeing old friends I see every four years on tour picking up as we if we talk everyday. And it’s days of discussing U2 and the music and waiting for the band. 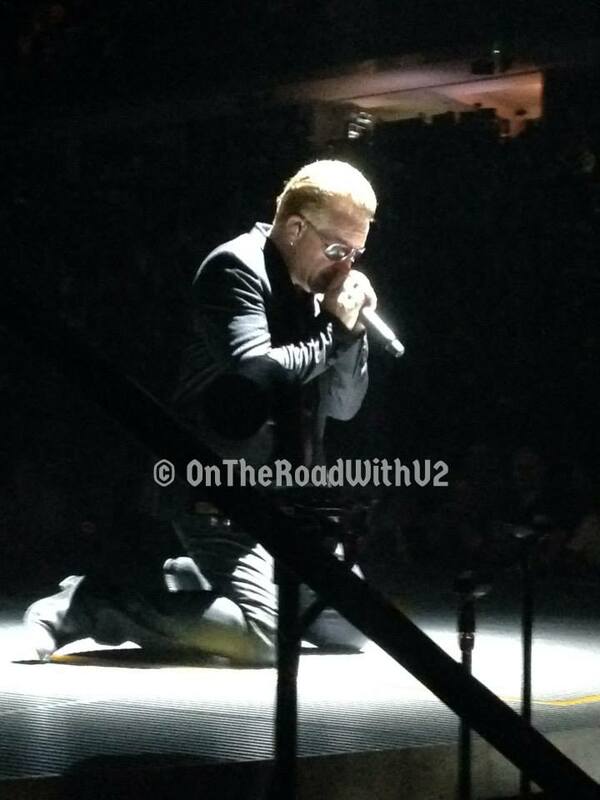 Hard to describe the love in my heart not only for U2 but for their fans. We’re so lucky! To see all my pictures from Vancouver, please click here. I literally spent a full day of traveling on Saturday May 16 leaving my hotel in Vancouver at 5:30am cst, a four hour layover in Dallas, then got home around 11:30pm est. I was having a tough time on Sunday. My knee was all jacked up and I was exhausted like I was hungover. But at least I didn’t gain any weight, even after my huge cheesy Mexican meal with sweet tea in Dallas during my long layover. I slept about 8-10 hours after only sleeping 11 hours total previous four nights. I won’t be as tired in Denver, Chicago, NYC because I won’t be sightseeing and when I do go out it will be on off days. I’ll just rest on show days. Forgot my routine from 360. Maybe I should have read my book 🙂 haha. See you On the Road with U2 in Denver starting June 5th! I had a blast friend! Thanks for the mentions. I’ll never forget it! My pleasure my new U2 friend. Had a great time! Thanks for reading and commenting. Since I didn’t have the chance to attend any of the shows it is great to read your posts! You give us a front seat of the IE Tour, thank you! Something that is a bit disappointing is that it seems that they completely ignored the #U2Request, and also that they preferred playing safe, rather than going for the different pair shows that they promised, anyways we are happy they are back on the road, hopefully they come back to Mexico City. Thanks for reading and commenting! I’m glad you enjoyed it. yes there were no real surprises and i knew nights 1 and 2 wouldn’t be completely different because bono had said so in an interview. they change up 6 songs though – and they never do that. so that was something.